Some of our most common questions from clients are about choosing the proper crate for pet shipping. At home, you might prefer the all metal cage over the fiberglass crates for visibility or airflow, but many home kennels will not be approved for pet transport. When shipping your dog, cat or other animal on an airplane, the airlines have strict requirements for travel kennels. The pet crate must have solid water-proof floor and a solid roof. All metal crates and crates with a door on top will not be allowed. The gate on the front of the crate must be metal and not plastic. The airlines want to be sure that your pet is secure in the crate at all times. Plastic doors can bend or warp and fail. You should not use a dial latch on the front door for opening the crate. These dials often fail and then the pet cannot be removed easily. There are a few airlines that still accept this type of carrier but most do not. Some crates can be modified to meet airline pet transport rules. For example, if you have a plastic crate that uses small plastic pegs that are used to hold the crate together, they can be replaced with metal bolts & wing nuts. Collapsible or Foldable Pet Carriers are obviously not approved for pet shipping. They may be acceptable if your small pet is traveling with you in the cabin of the airplane. 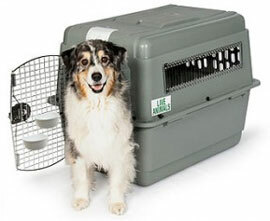 If your crate does not meet airline requirements, than you should invest in a new pet kennel. We like Petmate pet crates. They have been making reliable crates for pet shipping for a long time and are approved by all airlines. We also recommend using a travel pad to keep your dog or cat dry if they do urinate or spill water in the cage. DryFur makes a good travel pad. Here are instructions for measuring your dog. With the correct measurements, you can choose the proper pet crate size for your dog.